Low budget flicks are often a labor of love, and filmmaker Charles McCrann most likely found this out all too well during production of his lone film, Toxic Zombies, also known as Forest of Fear and Bloodeaters. In this film, McCrann was the director, writer, producer, actor and editor. I wouldn’t be surprised if he had the boom stuffed somewhere in his pants, the poor fellow. In the years after he put his Toxic touch on the horror world, he became senior vice-president of MMC in New York City and, tragically, was in the World Trade Center working when the planes struck the building on September 11. On his memorial page on the MMC website, friends speak of him still having excitement in his eyes when it came to talking with chums about the production of Toxic Zombies. It’s apparent from watching the film that McCrann was a drive-in horror buff and his one entry into the world of horror films captures precisely what the cheap, low budget and fan-pleasing realm of the drive-in feature film was all about. Is it good? No. It doesn’t have to be. There’s a big crop of marijuana being grown worth a couple million bucks and the feds are closing in on the dealers. After approaching their campsite resting in the hills in the middle of nowhere, they open fire on a young woman, taking her life. The dealers are ready for them and end up killing the two agents. Police/government higher-ups decide that after the two guys don’t return that they need to reach drastic measures to take out the crop, and the pushers. They decide to hire a street-wine swillin’ pilot to dispense a herbicide known as dromax over the area to kill the crops… and hopefully mess up the growers something awful. Their plan backfires as the dromax turns the weed men into a pack of hideously mutated zombies that are hell-bent on getting their revenge on government officials… or anyone else in biting, hatchet or machete swinging distance! Toxic Zombies is pretty much ideal drive-in enchantment. In the early days, films like The Giant Gila Monster and The Killer Shrews most likely headlined the bottom half of double or triple bills. Even drive-in staple AIP got their start in relatively mundane cheese flicks like The Screaming Skull and while they eventually doubled up budgets to make classics like The Pit and the Pendulum, the drive-in spirit of 'on the cheap' was still alive and well. Especially when you consider The Terror was actually quite an exceptional film that was made by recycling footage, directors and sets with a few days left on Boris Karloff’s contract. Herschell Gordon Lewis’ Blood Feast debuted in ’63 and the drive-in became the world’s first shanty of slaughter which began to breed great schlock like I Drink Your Blood. 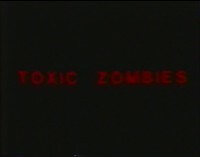 I throw out all these titles because if you have seen and enjoyed the auras of these low budget gems, you will undoubtedly enjoy the lovable carnage that is Toxic Zombies. The drive-in film is an acquired taste; you probably had to have been there or wanted to be there to enjoy the films to the fullest. If you seek out these films well below The Pit and the Pendulum on the terror chain, you essentially emulate the buttery popcorn munchin’, coke slammin’ fan who made it through every film on the bill while his pals in the backseat had long succumbed to sleep. Toxic Zombies has a shallow story and the acting is below par, but it accomplishes what every great bad drive-in movie should do; throw everything it has in the face of the audiences. Appropriately for a first film with a low budget, Charles McCrann doesn’t take anything too seriously. 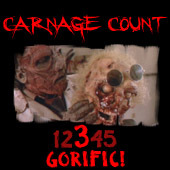 The film is full of cheesy gore effects and although the action isn’t tense or enveloping, the demented zombies are on display for a good portion of the film. This keeps the pace moving well, even though a lot of the victims are just randomly inserted into the film when McCrann feels the need to give the audience what they paid to see. I will admit to absolutely loving one truly exceptional scene when the zombies turn up brandishing furious flaming torches. If you’ve ever seen Burial Ground, you’ll have a chuckle here as McCrann takes a page from the Bianchi Book of Peter Bark. The most preposterous thing in the film isn’t the fact that the government is corrupt, introverted and mean (oh yes, expect Night of the Living Dead inspired social commentary!) and have plagued this field with a gnarly spray that turns those it covers into madmen, but the characters of siblings Jimmy and Amy. Jimmy is a mentally handicapped guy in overalls and his little sister Amy is played by an actress in her mid thirties! It’s wacky and almost disturbing to see this on film and it just encapsulates the drive-in experience of the film to a T. You’re going to howl at these two and the fact that their father proclaims, “And, Jimmy… well, even if he’s retarded, he’s gotta learn to get along in this world!” just makes everything so wrong, yet so right. Whenever the two are on the screen, some soft and innocent piano music plays and it almost had me in hysterics. As for the zombies, their faces are a bit mangled and they seem to like to drink blood and are basically parallel to a really pissed off version of the formaldehyde sniffers from Garden of the Dead. Come to think of it, the two would make a contrarily kindred double bill of weapon-wielding zombie righteousness. The cinematography is pretty standard and the lush woods setting is taken full advantage of, while the music combines a lot of different cheesy synth effects. There’s even a great point of view shot that looks like something right out of The Evil Dead. Substance unearths the Toxicity on DVD in another of its famous unauthorized VHS transfers complete with some tracking lines and a whole lot of hiss. No extras are included except needless shots taken from the movie. There are rumors that some edits of this film are cut, but reports seem to conflict and I have no way of telling which version this is. All I can say is the film is just over 88 minutes long and there’s still mangled faces and blood spurts in the film. I visited all the reviews I could find and saw no pictures featured in them that weren’t on the Substance DVD. When it comes right down to it, Toxic Zombies would be best described as a film you would have loved to have come across at your video store back when you were a kid. The plot isn’t worth harking on, but it’s funny and the zombies and bloodshed are a hell of a lot of fun. Rest in peace, Charlie, it’s too bad you couldn’t have made a few more like this. Rent it!